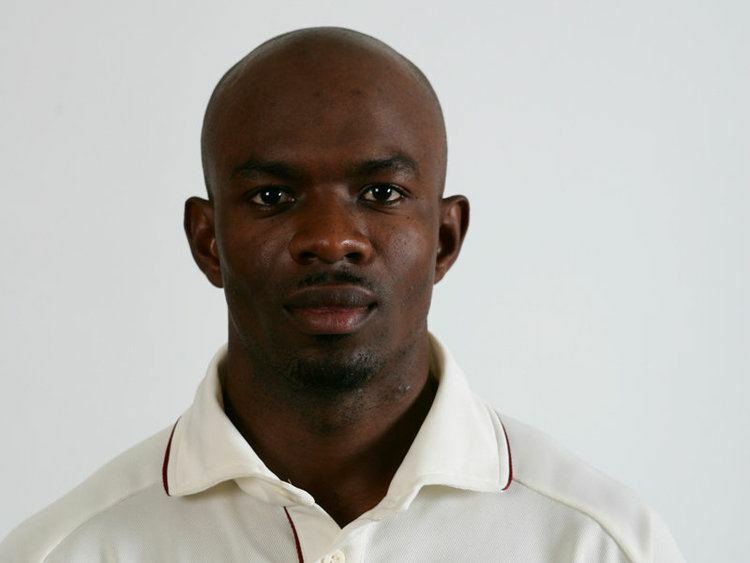 Devon Sheldon Smith (born 21 October 1981 in Hermitage, Grenada) is a cricketer who represents the West Indies. His primary role within the team is as an opening or top order left-handed batsman, he has bowled right arm off breaks in his career but rarely at international level. In the West Indian domestic competitions he plays for the Windward Islands. He has been described as a compact player who heavily favours scoring on the offside. He made his first-class debut in January 1999, opening the batting for the Windward Islands in a Regional Four Day Competition match, he made low scores of 12 and 4 in a heavy defeat to Barbados. His first half-century was brought up in his third match of the season, scoring 79 in the first innings against the Leeward Islands. It was the only time he passed 50 runs in his debut season, finishing with a batting average of 18.44 from nine innings, which is considered low for a specialist batsman. His average remained around that level over the following two seasons. Despite his relatively low scoring, he was picked to play for the West Indies A team against South Africa A in September 2000, making scores of 14 and 23 in a drawn match. In the 2000–01 season Smith was part of the Windward Islands team that won the List-A West Indian domestic competition for the second time in their history. The 2001–02 marked a significant improvement in Smith's form, he made 841 first-class runs at an average of 64.69 and scored his first century. A successful tour of England with the West Indies A team followed, yielding 465 runs at an average of 46.50. Smith made the step up to international cricket when he was selected in the West Indies squad to face Australia in their 2003 tour. He made his Test debut in the first match of a four-Test series at Bourda, a score of 3 in the first innings was followed by 62 in the second, in a match that Australia went on to win by 9 wickets. Despite scoring a pair in the second Test, Smith retained his place for the rest of the series, making another half-century in the third Test. Smith also made his ODI debut on the same tour, he played the first three matches of the seven-ODI series, making a highest score of 26. After being dropped from the West Indies team for their 2003–04 tours of Zimbabwe and South Africa, Smith regained his place for England's tour following an impressive domestic season, where he was the leading batsman in the Regional Four Day Competition, scoring 842 runs at an average of 76.54. His good form continued into the first Test of the series, where he made 108, described as a "gritty effort laced with occasional panache", his first Test century. Smith was unable to play in the final two matches of the four-Test series after fracturing his thumb while practising in the nets. From May 2004 to June 2005 Smith played six Test matches, failing to reach a half-century in that time. During the 2004 tour of England he played three ODIs in the NatWest Series, where he made a highest score of 44, it was his last appearance for the ODI team until January 2007. Smith made a slight return to form in November 2005 against Australia in Brisbane. In a heavy defeat he was the only West Indies player to score a half century, making 88 in the first innings. Despite this Smith did not perform well in the rest of the series and again lost his place in the side. Smith made his return to international cricket in January 2007 for the West Indies's tour of India, he played in three matches of the four-ODI series, making a highest score of 33. He retained his place in the side for the 2007 Cricket World Cup, he didn't feature in the early stages of the tournament, but he played three matches in the Super Eight stage. He averaged 33.00 from his three innings, including a highest score of 61. Smith played no further part in the tournament as the West Indies were unable to advance to the semi-finals. In June 2007 Smith made his Twenty20 International debut, striking three sixes in an innings of 61. Later in the year he played both of the West Indies's two matches in the World Twenty20, making scores of 35 and 51. His return to the Test side also came in 2007, he played in all four Tests of the series in England. It was a disappointing series from Smith who averaged 21.28 with a highest score of 42. This was followed by an even worse ODI series in Zimbabwe, where in four innings he only managed a highest score of 5. An improvement came on the tour to South Africa, he hit three sixes in a career best ODI innings of 91. After playing in the Test series against Sri Lanka and Australia, where he made a highest score of 48 from eight innings, he was dropped from the side for the tour to New Zealand. However, following a career best performance for the Windward Islands, scoring 212 runs against Guyana, he was rewarded with a recall to the side for the home series against England. He played in all five Tests of the series and finished with an average of 27.50 with a highest score of 55, his only half-century. He also played both matches of the following Test series, again against England. Although he failed to reach a half-century in his four innings, his average of 26.25 was the third highest for the West Indies. The second Test against England was the last Test Smith played in 2009, however he featured in the home ODI series against Bangladesh, where he made a highest score of 65. He was playing with an under-strength West Indies team because of the West Indies Players' Association strike. He played only one international match in 2010, scoring 55 in a drawn Test against Sri Lanka. Despite not playing in an ODI since September 2009, Smith was included in the West Indies squad for the 2011 Cricket World Cup. He finished the tournament as the highest run-scorer for the West Indies; 300 runs at an average of 42.85 and a top score of 107, his first ODI century. Following the World Cup, Smith was selected for the ODI and Test squads for Pakistan's tour. After disappointing Test and ODI series where, troubled by the spin bowling attack of Pakistan, Smith managed only 47 runs from five innings, he was dropped from the side. Smith was recalled to the West Indies team for the tour of South Africa on 1 December 2014 to replace an injured Chris Gayle.